Will This Year’s College Grads Job-Hop More Than Previous Grads? 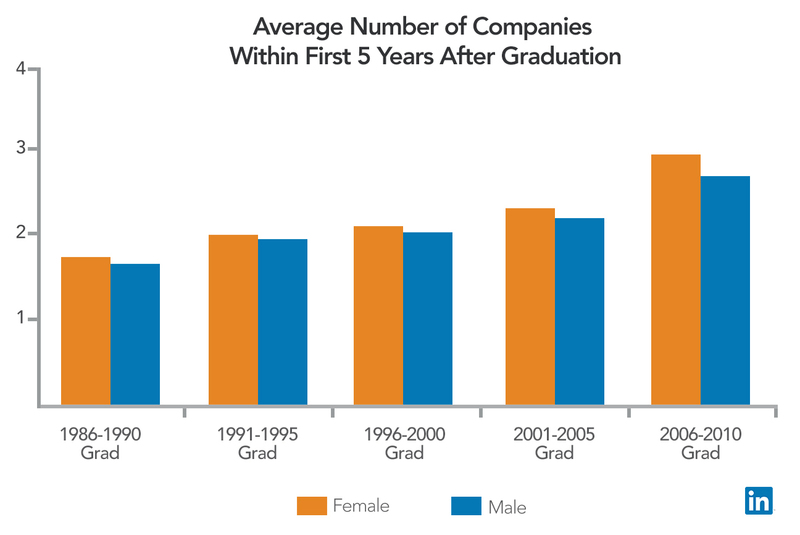 Over the last 20 years, the number of companies people worked for in the five years after they graduated has nearly doubled. People who graduated between 1986 and 1990 averaged more than 1.6 jobs, and people who graduated between 2006 and 2010 averaged nearly 2.85 jobs. As you can see in the graph below, the number of companies people work for five to 10 years after graduating has increased as well. What caused the uptick in job-hopping? We can’t say for sure. But common hypotheses include the Great Recession, and Millennials being more interested than previous generations in trying out different jobs before settling on a career. But one thing is for sure: upcoming and recent grads are likely going to job-hop more than previous generations, which means investing in professional relationships is more important than ever! People who ended up in the Media & Entertainment, Professional Services, and Government/Education/Non-Profits industries job-hopped the most the five years after they graduated. 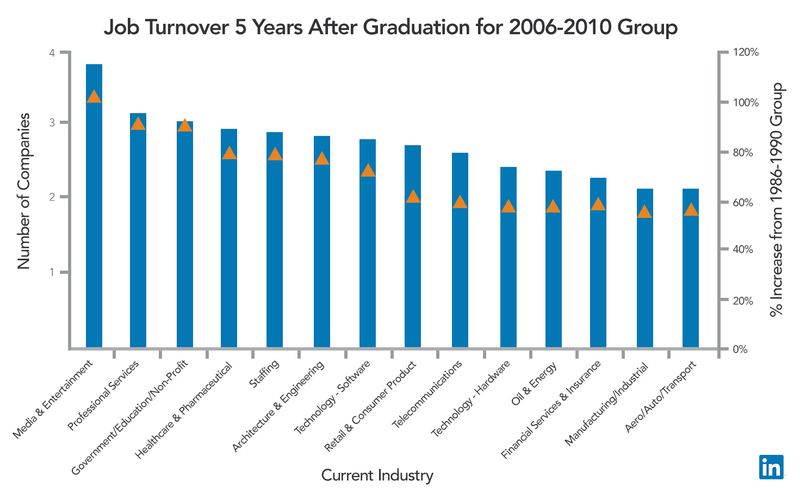 Whereas the Oil & Energy, Manufacturing/Industrial, and Aero/Auto/Transport industries are where the 2006-2010 grads who job-hopped the least the five years after they graduated ended up. So, if you’re a college student graduating in May and you prefer stability, the Oil & Energy, Manufacturing/Industrial, or Aero/Auto/Transport industries are likely your best bet. Whereas if you enjoy switching things up, a job in Media & Entertainment, Education, or with the Government may suit you better. To see which industries are hiring, and jobs available, check out the more than six million job listings on LinkedIn. I’ll also give you a little inside scoop - we have a big announcement coming next Monday specifically for soon-to-be college grads looking to find their first job. Keep your eyes peeled on our blog to learn more! We also discovered that while job-hopping is common for both genders, it’s slightly more common for women than men. And the widest job-hopping gap between women and men is among the most recent college grads (2006-2010). So there you have it -- Millennials are job-hopping more than previous generations. Case closed. Stay tuned to this blog for more insights that can help you advance your career. If you’re a data geek, feel free to check out my more detailed analysis of job-hopping on my LinkedIn profile and also check out recent posts by Millennials talking about their #jobhopping stories. The results of this analysis represent the world seen through the lens of LinkedIn data. As such, it is influenced by how members choose to use the site, which can vary based on professional, social, and regional culture. These variances were not accounted for in the analysis. For our basic unit of observation, we split college graduates in the United States since 1986 into 5 half-decade groups (1986-1990, 1991-1995, ... , 2006-2010). We used year of graduation with bachelor’s degree. We also restricted our sample to individuals who reported starting a job within one year of finishing college and have had LinkedIn activity within the past month. 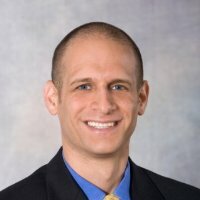 We did this to reduce the possibility that some older graduates may be omitting early work experiences from their LinkedIn profiles (maybe because they consider their early experiences less significant or not relevant to their current career goals), and to ensure we were only considering profiles that were most likely up to date.